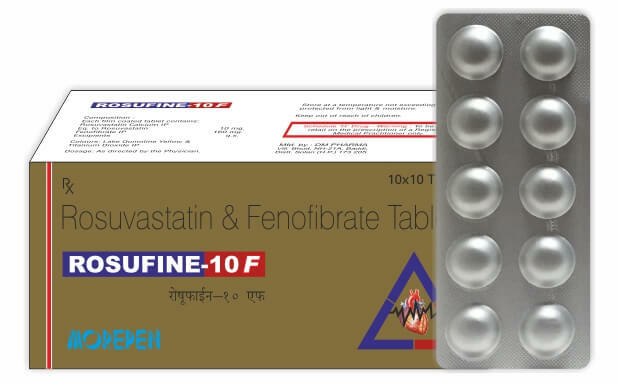 Rosuvastatin and Fenofibrate is an oral medication indicated as an adjunct to diet to treat mixed dyslipidemia, hypercholesterolemia and hypertriglyceridemia. Rosuvastatin is a member of the drug class of statins, used in combination with weight-loss to treat high cholesterol and related conditions, and to prevent cardiovascular disease. Rosuvastatin is a synthetic lipid lowering agent for oral administration. Fenofibrate is a drug of the fibrate class. It is mainly used to reduce of cardiovascular disease. Like other fibrates, it reduces both low-density lipoprotein (LDL) and very low density lipoprotein (VLDL) levels, as well as increasing high-density lipoprotein (HDL) levels and reducing triglyceride levels. It is used alone or along with statins in the treatment of hypercholesterolemia. Indicated for patients with mixed dyslipidemia, hypercholesterolemia and Hypertriglyceridemia. Mixed Dyslipidemia: indicated as adjunctive therapy to diet to reduce elevated total-C, LDL-C, ApoB and triglycerides and to increase HDL-C in adult patients with mixed dyslipidemia. Hypercholesterolemia: indicated as adjunctive therapy to diet to reduce elevated total-C, LDL-C, ApoB and to increase HDL-C in adult patients with primary hypercholesterolemia. Rosuvastatin is a selective and competitive inhibitor of 3-hydroxy-3-methylglutaryl coenzyme A (HMG-CoA) reductase, the rate-limiting enzyme that converts HMG-CoA to mevalonate, a precursor of cholesterol. In vivo studies in animals and in vitro studies in cultured animal and human cells have shown rosuvastatin to have a high uptake into, and selectivity for, action in the liver, the target organ for cholesterol lowering. In in vivo andin vitro studies, rosuvastatin produces its lipid-modifying effects in two ways. First, it increases the number of hepatic low-density lipoprotein LDL) receptors on the cell- surface to enhance uptake and catabolism of LDL. Second, rosuvastatin inhibits hepatic synthesis of very low-density lipoprotein (VLDL), which reduces the total number of VLDL and LDL particles. Fenofibrate is a pro-drug of the active chemical moiety fenofibric acid. Fenofibrate is converted by ester hydrolysis in the body to fenofibric acid which is the active constituent measurable in the circulation. Fenofibric acid, the active metabolite of fenofibrate, produces reductions in total cholesterol, LDL cholesterol, apolipoprotein B, total triglycerides and triglyceride rich lipoprotein (VLDL) in treated patients. In addition, treatment with fenofibrate results in increases in high density lipoprotein (HDL) and apolipoproteins apoAI and apoAII. It lowers lipid levels by activating Peroxisome proliferator-activated receptor alpha (PPARα). PPARα activates lipoprotein lipase and reduces apoprotein CIII, which increases lipolysis and elimination of triglyceride-rich particles from plasma. In clinical pharmacology studies in man, peak plasma concentrations of rosuvastatin were reached 3 to 5 hours following oral dosing. Both peak concentration (C max) and area under the plasma concentration-time curve (AUC) increased in approximate proportion to rosuvastatin dose. The absolute bioavailability of rosuvastatin is approximately 20%. Administration of rosuvastatin with food did not affect the AUC of rosuvastatin. The AUC of rosuvastatin does not differ following evening or morning drug administration. Plasma concentrations of fenofibric acid after administration of one 145 mg tablet are equivalent under fed conditions to one 200 mg micronized fenofibrate capsule. Fenofibrate is a pro-drug of the active chemical moiety fenofibric acid. Fenofibrate is converted by ester hydrolysis in the body of fenofibric acid, which is the active constituent measurable in the circulation. The absolute bioavailability of fenofibrate cannot be determined as the compound is virtually insoluble in aqueous media suitable for injection. However, fenofibrate is well absorbed from the gastrointestinal tract. Following oral administration in healthy volunteers, approximately 60% of a single dose of radio labeled fenofibrate appeared in urine, primarily as fenofibric acid and its glucuronate conjugate, and 25% was excreted in the feces. Peak plasma levels of fenofibric acid occur within 6 to 8 hours after administration. Exposure to fenofibric acid in plasma, as measured by Cmax and AUC, is not significantly different when a single 145 mg dose of fenofibrate is administered under fasting or nonfasting conditions. Mean volume of distribution at steady-state of rosuvastatin is approximately 134 liters. Rosuvastatin is 88% bound to plasma proteins, mostly albumin. This binding is reversible and independent of plasma concentrations. Upon multiple dosing of fenofibrate, fenofibric acid steady state is achieved within 9 days. Plasma concentrations of fenofibric acid at steady state are approximately double of those following a single dose. Serum protein binding was approximately 99% in normal and hyperlipidemic subjects. Rosuvastatin is not extensively metabolized; approximately 10% of a radiolabeled dose is recovered as metabolite. The major metabolite is N-desmethyl rosuvastatin, which is formed principally by cytochrome (CY) P450 2C9, and in vitro studies have demonstrated that N-desmethyl rosuvastatin has approximately one-sixth to one-half the HMG-CoA reductase inhibitory activity of the parent compound. Overall, greater than 90% of active plasma HMG-CoA reductase inhibitory activity is accounted for by the parent compound.Following oral administration, fenofibrate is rapidly hydrolyzed by esterases to the active metabolite, fenofibric acid; no unchanged fenofibrate is detected in plasma. Fenofibric acid is primarily conjugated with glucuronic acid and then excreted in the urine. A small amount of fenofibric acid is reduced at the carbonyl moiety to a benzhydrol metabolite which is, in turn, conjugated with glucuronic acid and excreted in urine. In vivo metabolism data indicate that neither fenofibrate nor fenofibric acid undergo oxidative metabolism (e.g., CYP450) to a significant extent. Following oral administration, rosuvastatin and its metabolites are primarily excreted in the feces (90%). The elimination half-life (t1/2) of rosuvastatin is approximately 19 hours. After an intravenous dose, approximately 28% of total body clearance was via the renal route, and 72% by the hepatic route. After absorption, fenofibrate is mainly excreted in the urine in the form of metabolites, primarily fenofibric acid and fenofibric acid glucuronide. After administration of radio labeled fenofibrate, approximately 60% of the dose appeared in the urine and 25% was excreted in the feces. Fenofibric acid is eliminated with a half-life of 20 hours, allowing once daily dosing. Patients who are hypersensitivity to any component of this product. Patients with active liver disease or renal impairment. This has been prescribed for the patient's specific condition. It may be dangerous to any other non pregnant lady. Patient should be apprised of the potential risks to the fetus and the lack of known clinical benefit with continued use during pregnancy. It should not be used in nursing mothers.